What's up with phones named The Pearl that are black instead of white? Examples: the BlackBerry Pearl and the Haier Pearl. Good thing RIM and T-Mobile finally got around to correcting this oversight with this still-dripping-wet White Pearl. 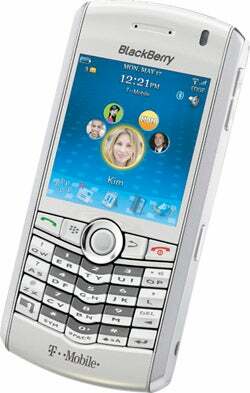 Not much has changed—the phone still has a 1.3-megapixel camera, BlackBerry push email, all sorts of IM support, HTML browser, the SureType not-quite-a-qwerty keyboard, MP3, 240x260 display, and Quad-Band GSM/EDGE. Which means there's no real reason to upgrade to the white Pearl if you already have the black one. But if you're in the market for a small smartphone—or if your office is forcing BlackBerry fever on you—check out the condensed review to see if it's the right fit. Plus, Valentine Day's is coming up, and what better present would your girlfriend like than to wear one of these on a chain around her neck?